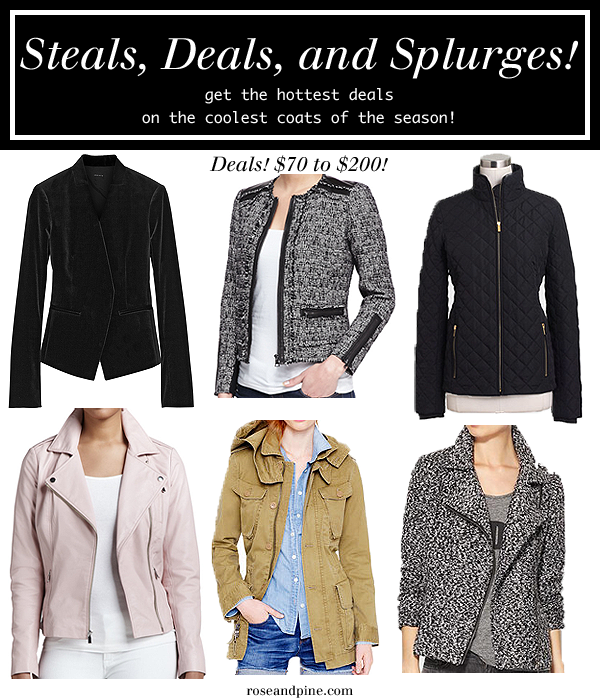 rose & pine: Steals, Deals, and Splurges: The Best Jackets & Coats for Every Price Point! 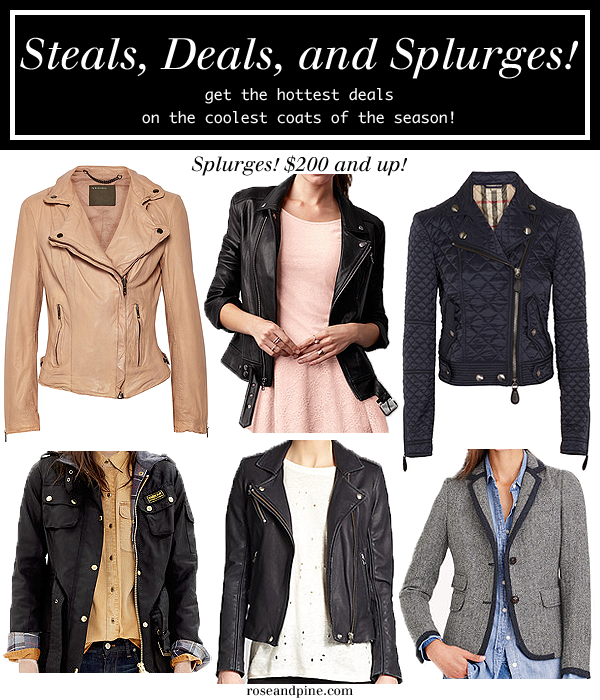 Steals, Deals, and Splurges: The Best Jackets & Coats for Every Price Point! Yesterday morning was the first day that I actually felt the need to wear a jacket when I left the house. I've stated before how much I hate coat and jacket shopping, trying on jackets makes me sweaty and tired and I just hate going through racks until I find one I love. So once again I will do a little bit of the dirty work for you and give you some links to the hottest coats and jackets for the cold weather this season for all price ranges! Whether you're on a budget or have a bit to spend, you can find an amazing coat or jacket below! One good thing to remember is that most of the time you get what you pay for when purchasing a jacket. 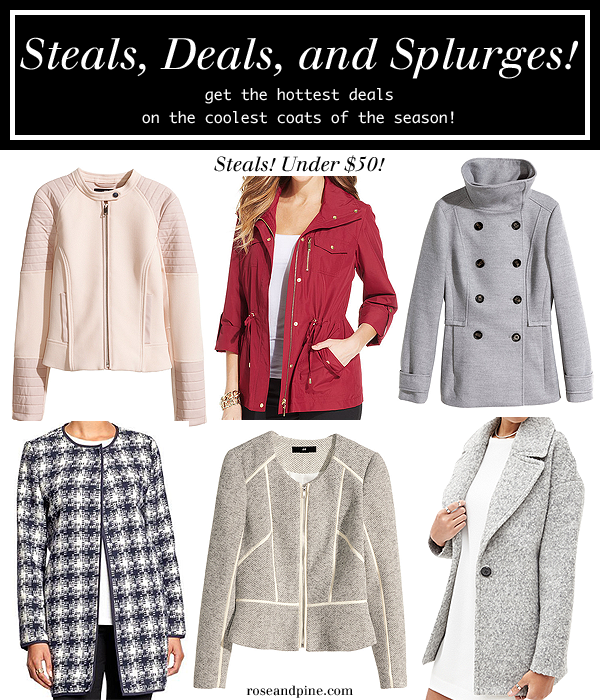 If you want a trendy coat that will last you a single season, go for one on the less expensive side, there's nothing wrong with getting something super trendy that will be out by next season! On the other hand, if you want a coat or jacket that will be a staple investment piece in your wardrobe for years to come, check out one of the pricier ones that are well worth the money! Check out these jackets and coats below and tell me what you think! Some of the jackets in this section are just purely to see a pretty coat, because I personally don't know anyone ready to drop over a grand on a piece of outerwear. Just relax and enjoy the pretty clothes. What outerwear will you be wearing this season?